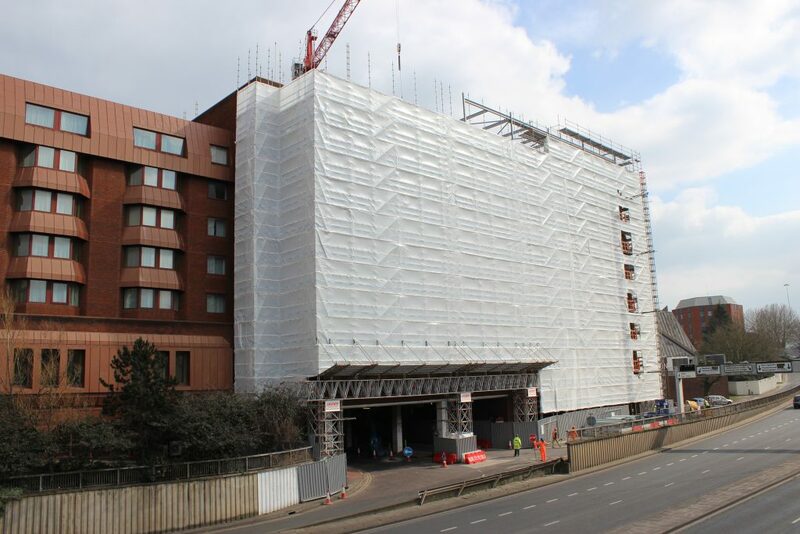 The world’s first use of the new universal aluminium HD beam from Layher is bringing key benefits to a major refurbishment project in Reading. Constructed entirely from light weight aluminium, the design features integral Allround rosettes as bracing points which utilise customers’ existing stocks to lace and brace pairs of beams together. 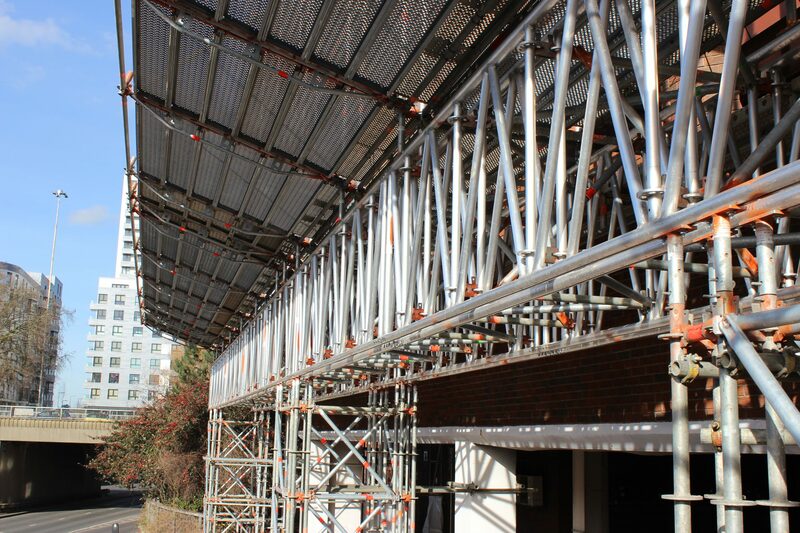 It can work with a variety of other adaption parts to allow integration of the beams into the scaffold itself to make full use of the beam’s and scaffold’s capacities which represents important gains compared with fixing to the outside of the scaffold that can weaken strength capacities. The project in Reading is seeing the transformation of the old ‘Yell House’ office building for Crown Student Living – ‘Queen’s Court’ will provide accommodation for 400 students. 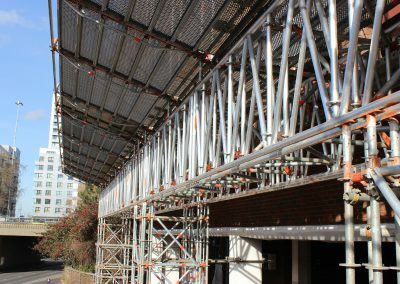 Scaffolding contractor Archway Services is using the beam both as a support for the scaffold structure above and, vitally, as a means of maintaining full public access to the on-site car park throughout the 11-month refurbishment programme. 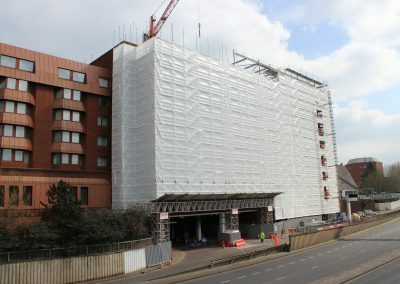 “The project on the L-shaped building, which is under the management of Osborne, features a total of 16 boarded lifts rising to an overall height of 30 metres,” says Sean Pike, Managing Director of Layher Ltd. “The car park within, which serves one of Reading’s main shopping centres, is accessed via an entry and exit tunnel at one of end of the main 50-metre façade – neither of which could be closed off at any point, not least during the build-up to the Christmas shopping period. Our new universal aluminium HD beam design has been positioned across the two adjacent openings to provide the optimum solution, with no road closures or even overnight work required.” The significance of the latter point is underscored by the refurbishment site being linked directly to one of the town’s most prestigious hotels. The beam was built at ground level on an adjacent plaza and then craned in two sections into position from above. A scaffold tower at each end and a third support structure at the centre point allowed the two wide access tunnels – large enough for shop delivery vehicles – to be maintained underneath. Leg load capacities of 116 kNs then enabled the full scaffold structure above to be supported by the 1.25 metre deep beam which itself has a total span of 26 metres. The design features 48.3 mm o/d vertical posts and diagonals. The uprights include integral rosettes and also allow traditional tube and couplers to be used as an alternative means of lacing and bracing. Archway Services also used Layher Allround to provide full scaffold access to all faces of the building which were then clad in fire retardant sheeting. Apart from its light weight, which eased handling and erection operations, the wide bay design of Allround and its need for only minimal cross-bracing have created the optimum layout for workforce access and movement during refurbishment work. This includes the installation of a new façade and windows throughout and the addition of two new storeys at roof level. “The system also enabled our workforce to accommodate a series of bay windows that project outwards from the building,” adds Mel Archer who notes that the reduced number of scaffolders needed for the installation helped to optimise safe working at height procedures. Layher steel decking was used throughout with the company’s stairtower systems also installed at key access points. Additionally, a full width fan structure provided protection across the main car park entrance and exit and also above a second archway created above a further access road at the rear of the building. Here, Archway Services used Layher’s established bridging beam system. “This is an excellent demonstration of the benefits that can be gained from the use of the new universal aluminium HD beam and we are proud to have achieved a genuine ‘world’s first’,” says Sean Pike. “It is providing an important solution to a key requirement at the site for the length of the project, fulfilling the specific needs of all concerned – from the shopping centre and car park management to the local authority and, of course, Crown Student Living,” he concludes.